The reception dinner on monday October 1st will be held in the french senat house, at the Palais du Luxembourg (Luxembourg Palace). To go to the Luxembourg Palace from the Conference center, you can take the RER A at the stop Charles de Gaulle Etoile (place de l'etoile, where is located the Arc de Triomphe), direction "Marne-la-vallée" or "Boissy Saint Léger". Then stop at "Chatelet les Halles" and use the connection with RER B, direction "Saint-Rèmy-les-Chevreuses" or "Robinson". Stop at Luxembourg. The enter the Luxembourg garden (in front of the RER stop) and head towards the Senat House. The palace was built fo Marie de Médicis, mother of king Louis XIII of France, on the site of an old hôtel particulier owned by François, duc de Luxembourg, hence its name. Her architect was Salomon de Brosse. Its construction and furnishing formed her major artistic project, though nothing remains today of the interiors as they were created for her, save some architectural fragments reassembled in the Salle du Livre d'Or. In the nineteenth century the palace was extensively remodeled, with a new garden façade by Alphonse de Gisors, and a cycle of paintings by Eugène Delacroix that was added to the library. The formal Luxembourg Garden (Jardin du Luxembourg) presents a 25-hectare green parterre of gravel and lawn populated with statues and provided with large basins of water where children sail model boats. In the southwest corner, there is an orchard of apple and pear trees and the théâtre des marionettes (pupett theatre). 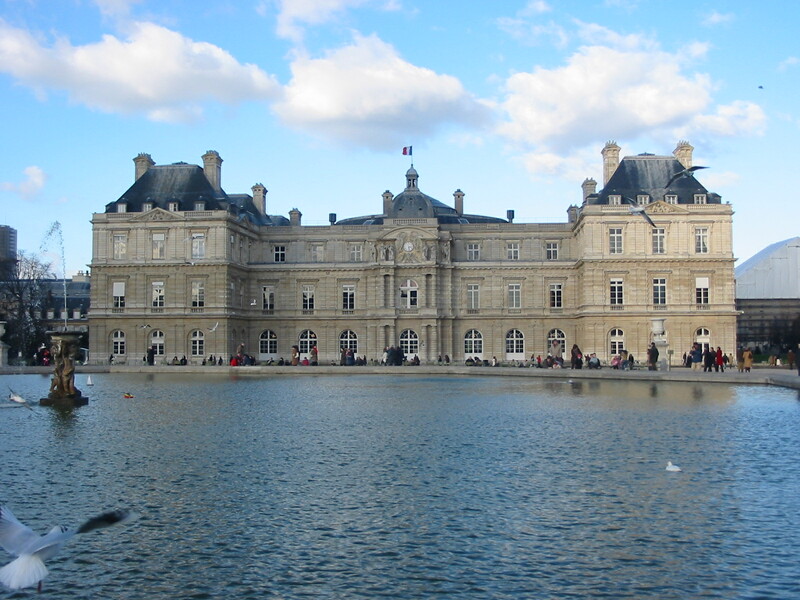 The palace is located north of the Jardins du Luxembourg (Luxembourg Garden) which is open to the public. The gardens include a large fenced-in playground that is very popular with local young children and their parents. Adjacent to it is an excellent puppet theatre and a merry-go-round. On occasion, pony rides are also available. In addition, free musical performances are presented in a gazebo on the grounds and there is an anonymous, inexpensive restaurant nearby, under the trees, with both indoor and outdoor seating from which you can enjoy the music over a glass of wine. The garden is enjoyable for its calm. On the little pond children play with miniature boats. The garden contains various statues and sculptures.